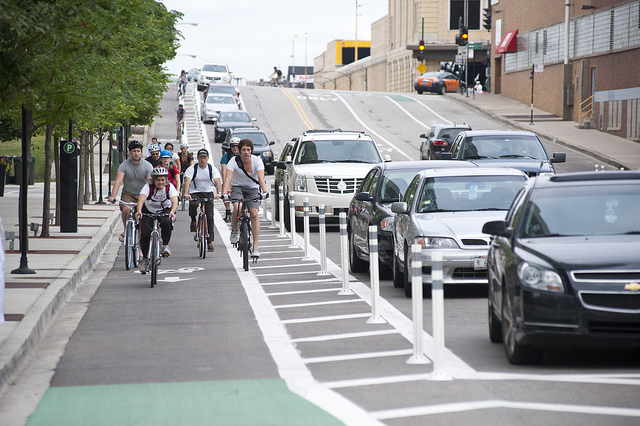 Protected bike lanes are pretty much the bee’s knees. They make people feel safer riding a bike. They have led to significant increases in cycling and major reductions injuries to all street users. Cities are literally racing to install these things. Protected bike lanes are already in place in 32 American cities, and the total number is expected to double this year. But for a very long time, the American Association of State Highway and Transportation Officials has refused to recognize these treatments in its influential engineering guides — a major barrier to the proliferation of protected bike lanes in the U.S. But great news! Michael Andersen at the Green Lane Project says that protected bike lanes may soon get the official, unequivocal blessing of another powerful authority in the transportation engineering world: The Federal Highway Administration. In a task order proposal request quietly circulated to selected contractors last week, the federal agency that oversees U.S. road design did exactly what many biking advocates have been urging it to do for years: It suggested that physically separated bikeways can be welcome improvements to American streets and kicked off a process intended to prove it. It’s a move that could have big consequences for American cities whose traffic engineers have avoided building separated bike lanes due to a lack of federal guidance. As ordered by the FHWA, the forthcoming study will look at crash rates and types at 10 to 20 locations that currently offer physically separated cycle tracks, creating a set of recommended design standards and guidelines that FHWA’s influence might eventually integrate into the two bibles of U.S. road design: the Manual of Uniform Traffic Control Devices, which discusses traffic signs, signals and markings; and the American Association of State Highway and Transportation Officials road design guide, which discusses the shapes and materials of safe roadways. Elsewhere on the Network today: Better Institutions takes a critical look at the many subsidies that encourage sprawl. This Big City shares some of the world’s coolest street furniture. And Mobilizing the Region points out that many of the most dangerous cities for pedestrians also have elevated obesity rates.